"Acer will use the pre-announced higher-end APUs, the Ryzen 7 2700U and Ryzen 5 2500U, but will also be pairing this with a Radeon RX 560 graphics chip." Literally the rest of the paragraph answers the question. Ian, if you get a chance can you ask AMD about their plans for Playready 3.0 support? Currently there is no AMD solution to play back 4k encrypted content on PC. The only AMD hardware with 4k DRM decryption support is Xbox One S/X. "Currently there is no AMD solution to play back 4k encrypted content on PC. .......they seem oblivious to this. " That seems like the SOLUTION, not the Problem! It was created for the end user to stream whatever they want over their own network FOR FREE! GET YOUR DRM GARBAGE OFF "MY" COMPUTER! I do not honor your Licenses, Copyrights, Trademarks or Patents! AMD executing right now and while there is argument that they've played it safe with Zen so far, they are in a very favorable position in the market. 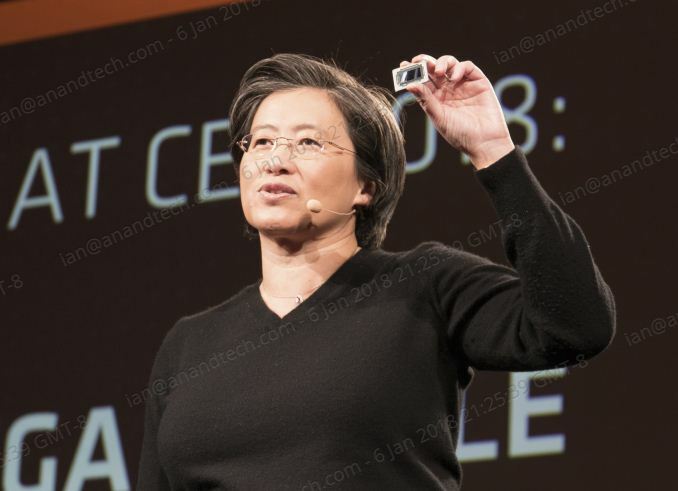 -"While most of the roadmap could have been predicted by those of us embedded in this industry, it was good to see AMD volunteering a lot of information. This can be a bit of a double-edged sword, if a competitor knows what you have planned". AMD knows that Intel's roadmap is in chaos as right now and pushing existing Zen designs to lower power envelopes and/or increasing clock speeds will close the performance gap. If Zen 2 advances in terms of IPC by any significant margin, they could actually pull ahead in 2019 but that entirely depends on Intel's response, in particular Ice Lake. "Death blow"? You seem to vastly overestimate the amount of silicon GoFlo can produce. Even if everything goes right for AMD, Intel will be shipping Cannon Lake chips left and right to consumers (the chips in the article appeared mostly for consumers) as GoFlo furiously produces Zepplin (or whatever its followup is called) and AMD ships them as hyperprofitable EPYC chips.